When the power FETs are conducting they are in essence resistors. H Bridge designers will try to make these resistors as small as possible, but at the end you will end up paying for whatever resistor you get, with the smaller the resistance value, the larger the price tag. By now it should be obvious why this is as such, but if not let me offer another data point. The only way to make a resistor smaller in ohmage, is by increasing its area. So when an H Bridge is built with humongous FETs (the RDSon is quite small), then the die area is considerable and you must pay for this. But the advantages are obvious, as the smaller the RDSon, the smaller the Ptotal. Why do we care about this so much? An example is needed here. Lets talk about a nice device such as the DRV8824, which is an integrated stepper driver, or in other words, a dual H Bridge device. This means there are two H Bridges or four FETs conducting at all times. We will see what this means in terms of power dissipation. First, lets find out what the RDSon on the DRV8824 is. According to the data sheet, the RDSon for the DRV8824 is about 0.65 ohms per FET when the die is at room temperature (25C). When the die is hot, it will have an RDSon of 0.9 Ohms. This makes sense as another law of physics is that the hotter a material is, the more resistive it becomes. Unfortunately this does not help us one bit. Because if we put a current across the FET, a heat directly proportional to that current and the resistance will be generated which in turn will increase the resistance. So as you can see, chances are our die will not be running at 25C for very long. This is why I prefer to use the high temperature RDSon value when computing total power. We can now fill the first equation and see how much power will become heat on each power FET. But can we? What is the current? No need to offer all the details on what is VREF and what is RSENSE, but instead let me run an experiment with different values of ITRIP, in this case 0.5A, 1A, 1.5A and 2A. Assume that we have chosen the VREF and the RSENSE to obtain these four values. What I must explain, however, is that this ITRIP is the maximum current the sine wave imposed on the stepper winding will see. 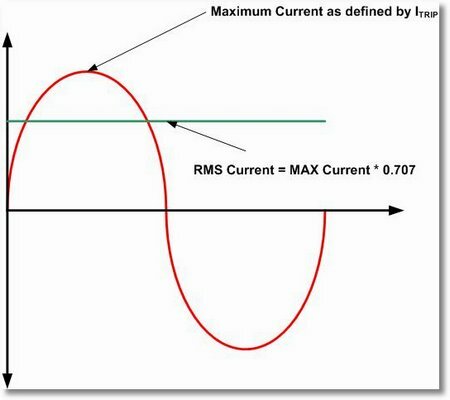 But the current we need to take into consideration is the RMS current. Remember that as the stepper is moving current will become as large as ITRIP but will also be as low as 0A. Hence, what we need is an average current. In the case of a sine wave, the RMS current gives the closest approximation and all we need to do is multiply the ITRIP by the factor 0.707. OK, now we can get busy! Figure 2: We will use the RMS current on our power calculations. Notice how it gets worst as current increases. This is why H Bridges are rated at one maximum current. At some point the power dissipation is so high, it is just impossible to run at the heat generated. The die would catch flames. Of course this does not happen in real life as devices are protected against high temperature but at the end the result is the same. As the thermal protection kicks in, the H Bridge is disabled and the motor can not operate. Darn it! This is not good! The 500 mA case does not look to bad, but everybody else is looking grim. Even at 1A we have close to 2W dissipation. The 1.5A scenario just seems too harsh and the 2A I can already tell you is a no go. 8W is just beyond the rating for this device although I want to point out that it is not impossible. Just not cost effective. More on that later. Power dissipation is pretty much meaningless if we do not compute how much this translates to in temperature, or heat. In this case what we want to know is how hot is the die. Why? Well, for starters because the die can not get too hot. If it gets too hot, the device will protect itself and get disabled which is what we must ensure never happens. For this device this threshold is set at about 150C. Will we get there? In order to determine what kind of outlook we are looking at here, we need to understand thermal impedance. Now there is a gazillion ways in which to explain thermal impedance to induce brain tumors, total ignorance and major misunderstanding. So let me cut all the mathematic crap and tell you that thermal impedance is how easy it is to release heat from your device. In the same fashion that a resistor with zero resistance would allow infinite current to pass through, a material with zero thermal impedance would allow infinite heat to flow through. If we can extract all the heat from your device, then it can not get hot. The jury is out. We can already see which parameters will work and which one will not. As the DRV8824 is rated at 1.6A sine wave peak per phase, it should not come to a surprise that the 2A version is not possible no matter which board is used. Maybe if we cool the board with liquid nitrogen, the 2A version would then be viable. But how viable is to use a cheap device with a superbly expensive liquid nitrogen rig? It is just preposterous! Which is why you would not use this device to drive 2A steppers. Now, notice that at 1.5A we are still not too shabby. The four layer board can almost take it whereas the 2 layer board simply can not. Remember we just computed temperature rise, not actual temperature. To the resulting temperature rise you need to add the actual ambient temperature. Hence, a 4 layer board can only drive a 1.5A stepper at room temperature of 25C. Any hotter would take us to thermal shutdown. This is the kind of analysis a designer must perform in order to define which device to use. You, as an user, can take advantage of this knowledge as well. Chances are that you will not be as critical as an engineer wanting to design an application which must run cool both at the North Pole and the Sahara desert. But if that is the case, now you know how to compute the limits. If at the end you want more current, you will need either better thermal impedance or lower RDSon. A good example would be to consider the DRV8825 which has a third of the RDSon. How good things get I’ll let for you to find out. You already know how! Thank you very much for this usefull information! I have one big question about this topic. 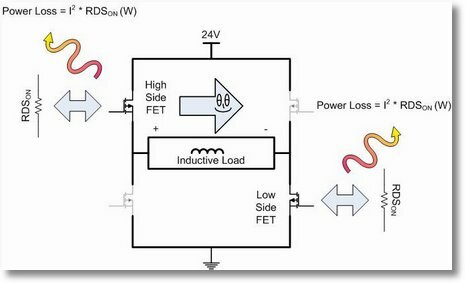 What happens with the temperature rise when we use a PWM-signal to open and close the fet’s? Do we need a multiplication with the dutycycle or doesn’t anything happen because when we are freewheeling trough our body diodes wich makes the same amount of dissipation stay? The equation and post above assumes an average current, so whether you obtained it by saturating the circuit or by applying a current regulation scheme through a PWM mechanism, does not change the result that much. Now, in essence the I^2*R equation does not change one bit as the current is average whether you are PWMing or not. However, if you are PWMing you will need to add the switching losses into the equation. Seems like a good topic to add, so I will write about it soon! Keep posted and I will explain how this works! PS: Switching losses are often ignored as they are smaller than the actual power dissipation caused by resistance and current. However, when the frequency is high, and if the power stage is not very efficient, then the switching losses will need to be considered!